Sorry to have dropped off the face of the earth for the past month or so. I’ve been having some issues with vertigo that made a low-sodium diet necessary and I’m still trying to adjust to that. In addition, I was traveling for a couple of weeks. At any rate, I’ll do my best to get back to a weekly blog schedule, vertigo permitting. 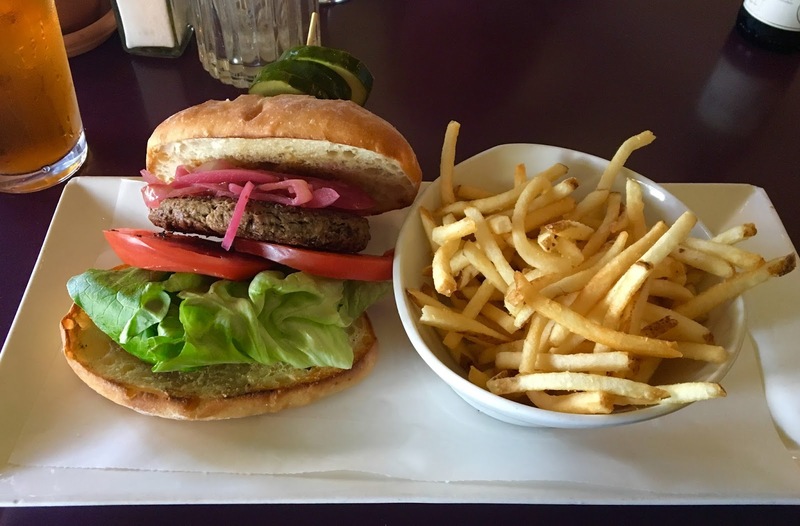 This week, I visited a restaurant that I stopped going to when I went vegan more than fifteen years ago — 33rd Street Bistro in East Sacramento. I used to love having lunch there, but after I went vegan, I discovered they had nothing on their menu that I could eat. That changed recently when they began offering the Impossible Burger, one of the new generation of veggie burgers that’s supposed to look and taste like the real thing. My friends Cathy and Genevieve went with me to 33rd Street Bistro a few days ago so I could check it out. I’m a huge fan of the Beyond Burger that’s available at Broderick Roadhouse these days, and I couldn’t imagine that the Impossible Burger would be able to compare with that. I was wrong. I loved the Impossible Burger, at least as much as the Beyond Burger. For starters, it doesn’t have that pink center that kind of creeps me out when I eat a Beyond Burger. And it looks and tastes exactly like the burgers I remember from my pre-vegan days. Really, the only complaint I had about this burger was that 33rd Street Bistro hasn’t taken the extra step yet to provide a vegan cheese option. If they ever do that, I’ll be heading back over there for lunch regularly again, just like in the old days. 33rd Street Bistro is located at 3301 Folsom Boulevard, and their phone number is 916-455-2233. Their website address is http://www.33rdstreetbistro.com/, and their Facebook page can be found at https://www.facebook.com/33rdStreetBistro/. The restaurant is open Sunday through Wednesday from 8:00 a.m. to 9:00 p.m., and Thursday through Saturday from 8:00 a.m. to 10:00 p.m.